The President of the United States has available certain powers that may be exercised in the event that the nation is threatened by crisis, exigency, or emergency circumstances (other than natural disasters, war, or near-war situations). Such powers may be stated explicitly or implied by the Constitution, assumed by the Chief Executive to be permissible constitutionally, or inferred from or specified by statute. Through legislation, Congress has made a great many delegations of authority in this regard over the past 230 years. There are, however, limits and restraints upon the President in his exercise of emergency powers. 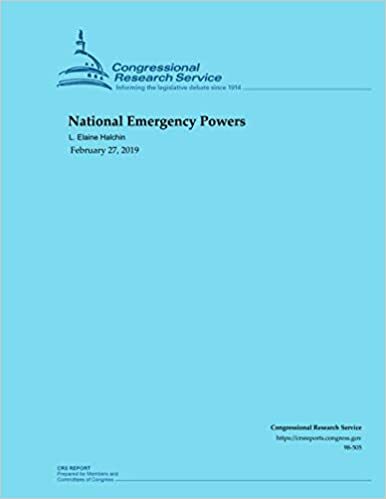 With the exception of the habeas corpus clause, the Constitution makes no allowance for the suspension of any of its provisions during a national emergency. Disputes over the constitutionality or legality of the exercise of emergency powers are judicially reviewable. Both the judiciary and Congress, as co-equal branches, can restrain the executive regarding emergency powers. So can public opinion. Since 1976, the President has been subject to certain procedural formalities in utilizing some statutorily delegated emergency authority.